A real winner, probably the largest private patio of all the places we manage! This two bedroom maisonette apartment has stunning sea views, balcony and exclusive use of a large decked patio– perfect for the summer holidays. Top Deck is situated in the same development as Centre Point on Sunnyside Road. With parking immediately outside there are steps to the front door and then a flight of stairs (11 then another 6) inside from the front door to the main living area therefore this won’t be suitable for people with disabilities or can’t manage too many stairs. The small kitchen is equipped with under worktop fridge, oven, microwave, full size dishwasher, 4 slice toaster etc. There is a separate utility cupboard with washer/dryer and small freezer off the hall. The main room is open to the kitchen and has an extending dining table to seat 4/6, large sofa and 2 chairs, TV/DVD and small balcony with 2 bistro chairs which are stored inside. This balcony is south facing and gives the most stunning view over the village, beach and out to Hartland Point beyond. This apartment also has Superfast Wi-Fi. This lovely apartment even has that amazing view from the master bedroom with king size bed, clothes storage and own en-suite with shower, basin and WC. The twin bedroom also has a shower room en-suite with shower, basin and WC. It has plenty of clothes storage and is at the rear of the building overlooking the parking area and National Trust land beyond. Along with the lovely balcony Top Deck has exclusive use of a large decking area with wooden table and chairs, ideal for an alfresco meal or to sunbathe. Please note that it has a right of way for the landlord of the building but only by way of access and is rarely used apart from to water plants etc. Access is down the entrance stairs and steps then through the car parking areas, round the side of the building and past the entrance to another apartment and their patio area so it is not immediately adjacent to Top Deck. There is also now a shed for guests use to store boards and beach equipment. All in all a great choice for a family wishing to enjoy being near the village and beach for a summer holiday or for couples at anytime of year to enjoy the peace yet close proximity of the village amenities. 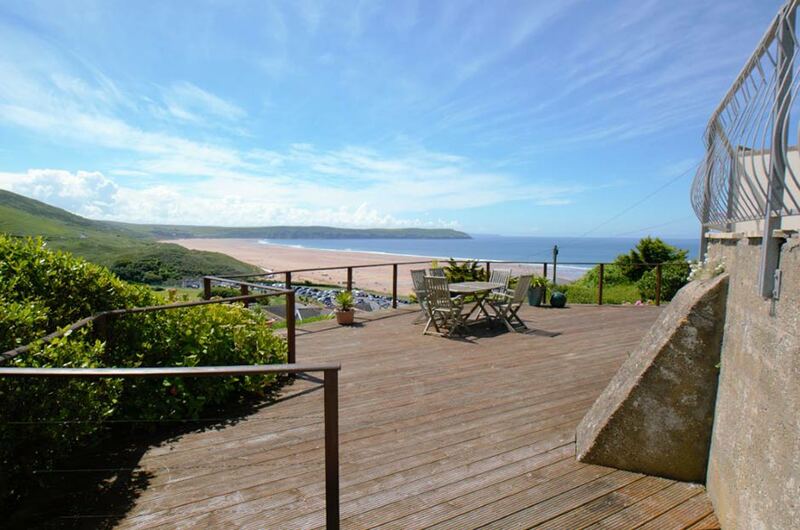 Upsides: 2 en-suites, sea view balcony – large unattached outdoor terrace - Superfast Broadband!! - Everything else!! !